In January 2011, after three decades under President Hosni Mubarak, the Egyptian people joined together in an uprising – subsequently dubbed the January 25 Revolution – that was widely seen as an important move towards greater civil and political freedoms in the country. However, since then security in the country has deteriorated – and it is Egypt’s religious minorities who are bearing the brunt of this renewed violence. 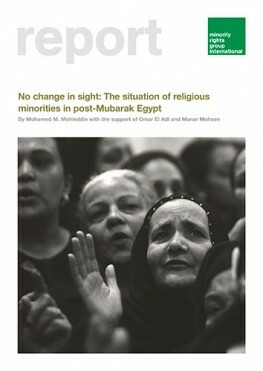 This report, drawing on interviews with minority representatives and human rights activists in the country, explores the troubling continuation of the marginalization and insecurity that characterized the situation of religious minorities during the Mubarak era. These include an ongoing climate of impunity, enabled by the government’s unwillingness to prevent or prosecute sectarian violence, as well as restrictive legislation, engrained prejudice and the prevalence of hate speech in political and religious discourse. The discrimination and violence that religious minorities still face, almost three years on from the removal of Mubarak, reflect deep and persistent inequalities that have remained remarkably intact in spite of the country’s political upheaval. As the findings of this report suggest, Egypt requires a comprehensive transformation of its current social and institutional environment, from education and media to legislation and the judiciary, if the root causes of the problems confronting religious minorities are to be effectively addressed. As sectarian violence is an important factor in its continued instability, the situation of Egypt’s minority groups will also have lasting implications for the future of the entire population. Download the full report in English or Arabic. Will you stay silent as Egypt’s religious minorities are persecuted? Please donate to MRG’s urgent work with religious minorities in Egypt and other similar countries. Read more about Egypt in our online Directory. Visit the Minority Voices Newsroom for multimedia content from minority groups around the world.